Triumph is planning to replace its TT600 with a lighter, faster version and it will be unveiled before the end of the year. Codenamed " R " , it will not only have improved performance, but also a sharper more 21st century look. 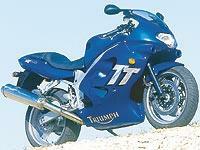 Since its launch in 2000, Triumph has been working to sort out glitches with the TT600’s fuel injection system. It seems to have finally sorted that on the 2002 bike, which performed well in an MCN road test last month. Triumph is expected to stick with the current engine as it has plentiful supply and needs to get at least five years’ life from the powerplant. But it has given the unit to an outside design agency in a bid to find more power. An insider said: " The TT600 is easy to ride and has great brakes, but needs to be lighter and faster. And the styling is obsolete so that will change. " Sources close to the factory say Triumph is modelling the machine on an existing Japanese 600cc sports bike, just as it did with the TT, which suggests the styling could be as derivative as the last one (often described in terms of Honda’s CBR600). It is expected Triumph will unveil the bike at either the Munich Show in September or on home soil at the NEC Show in November. Expect the price to be close to the TT600, which is listed at £6869 on the road.